About Us - Cleaning Spree! 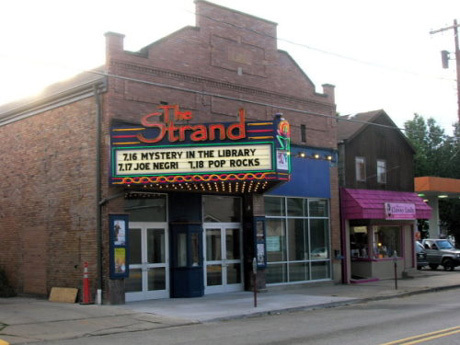 One of our favorite places in Zelie, The Strand movie theater and concert hall! Tammi grew up in Zelienople so it was a logical place to move the family when we were looking for a place to land. After a few weeks of unfruitful job searching we decided to start a business. Having a background in restaurants, hotels, retail, and non-profits, we knew we wanted to do something that made people happy and we didn’t mind working hard. Thus, Cleaning Spree! was born. Olga Monper is Tammi’s grandmother, and also her inspiration for providing cleaning services. Olga and Tammi spent many Saturday mornings cleaning together. After “redding up the whole house” they would break for a late lunch and spend time shopping. Later, after moving in with Tammi’s family for mutual support, Olga took over as home maker so Tammi’s mother could work. Tammi continued to spend many hours cleaning with her “Gram” and watched as she provided a pleasant home for her family. Tammi still cleans like her Grandma and her influence lives on in everything we do. Thank you, Ollie, your hard work lives on. Tammi placed her first Craigslist ad in August 2013 and cleaned her first home on September 11. From the beginning, the focus has been on improving lives by being trustworthy and over-delivering on our promises. Fast forward to today and Cleaning Spree has grown at an incredible pace. Both Tammi and her husband, Andrew, build the business full time and are currently getting the business ready to bring on employees. We know there is adventure ahead and look forward to the challenges. We believe that everyone deserves to live in a clean home. Regular cleanings reduce sickness, promote productivity, and increase general peace and happiness. Creating a business that does all that is an incredible pleasure. We are very grateful to our clients who took us on when we were new and untested. It can be a harrowing experience to trust a new service with your keys or precious possessions and these good folks were willing to take a step of faith even as we were doing the same. Thanks to you we are moving forward and making a better today for many people.